Can I Relax Now? I Have the Entire Year to Start Writing, Right? Don’t get stuck in the mindset that it’s a new year and there’s plenty of time to get started. If you do, you’ll fall behind other top authors in your niche. Other top authors have likely been planning and outlining their content for weeks, even months, to start strong in the new year. If you haven’t prepared your content for 2015, put your worries aside. … It’s not too late and we’re here to help! First, when developing your content, it’s beneficial to think about engaging your audience at an opportune time, a time when readers are looking for change. When you find the time is right, entertain them with tips and advice that leave a powerful impression and encourage them to take action. Regardless of your niche, there’s no better time to begin with fresh, new content than in a brand new year! Use this blog to find inspiration to begin the year with your best content. These tips may be your solution to develop a new set of articles and to steer your audience in the right direction throughout 2015. Get started today! 1. Start with a Great Story: I’m sure something interesting, shocking (in a good way) or enlightening happened to you in 2014. Now is your chance to grab your readers’ hand and walk them through the experience. Build momentum in your story, and begin by introducing a mystery or something that will keep your readers interested enough to hear the ending. Get them excited for you as well as themselves for the rest of the year! 2. Only Use Well-Written Content: It doesn’t matter if you have ten articles ready to go, or a hundred. If the quality is poor, the feedback will be as equally poor. Your content needs to be smart, engaging, and include tips that are not easily searchable on the first page of any search engine. If you haven’t started any new articles, be mindful in what you present. Think about this to motivate you: As an author, you’re only as good as your worst article! 3. Know What Your Audience Craves: There is always importance in doing research on your potential customers and figuring out what it takes to get their attention. Research your competitors and figure out what content continues to win with audiences. Better yet, ask questions to figure out what they want. Send an easy-to-fill-out survey discussing future projects and what types of content they enjoy. Win bonus points by offering a free reward for their participation. 4. Bust a Few Myths from the Previous Year: Who doesn’t like introducing myths and setting the record straight? These types of articles are always fun to create, and they are even better for opening up the conversation based on your opinion. Think about areas of your niche that are still being questioned, and give your expert advice to your readers to put the topic to rest. If you’re looking for ideas on how to start an article of this nature, take a look at this Myth-Busting Article Template. 5. Inspire, Motivate and Encourage: There are a handful of people out there who feed on negative energy and won’t give anyone a chance to cheer them up. However, there are more people that give motivation a chance and will listen to a little encouragement. You need to make your readers feel something by relating to them without going over their head. Give them a goal or a key personality trait to focus on for the New Year. 6. Use Real World Experiences: A good tip for a new set of articles is to introduce different topics and back them up with true, real world experiences. Think about how real life can inspire your writing, and how you’re going to shift your focus in the New Year based on facts. Reflect on the emotions you’re able to channel into what you write. Introduce a well-known fact or everyday frustration and spin it according to your niche. 7. Score Points with Headings and Lists: People can instantly recognize and understand headings and numbers, especially in articles. If you’re used to writing giant, technical content-filled paragraphs that are difficult to digest, try structuring your main points into lists. Consistency is important, so break up your content so it has a clear beginning and end to avoid confusion. Make it bold and beautiful! 8. Offer New Angles on Old Topics: There are old topics that most people can relate to and comprehend. Then there are new topics that are unfamiliar or haven’t been discussed by most people. Use your writing skills to bring back old discussions and offer a new angle on the outcome. Try and get a satisfactory reaction from your readers by giving something they haven’t heard before. 9. Collaborate with Other Authors: If you’ve been riding solo as an author, the New Year is a good opportunity to reach out to other authors. Do some networking on social media sites and try collaborating with someone in your field. Two authors can be better than one, especially for marketing purposes and improving your credibility. 10. Focus on Your Passion: The last tip to write quality content is to focus your energy on topics that have real meaning for you. If you’re not passionate about your writing, your audience will not feel it either. Stick to what you know and care about, and the feedback you receive will be overwhelming. This is just the beginning of a great year for you. If you did get a late start on the New Year, can you envision what you need to do to get on track? Use the above tips and share your knowledge with your readers, so they come back for more all year long! If you need further assistance in creating quality content, click here for another interesting article on the topic. Thanks for this valuable hints. I will try my possible best to see how I can write more interesting articles in this new year. Cheers. Content is always the King. As early as we post the unique content compare to our competitor our content will get priority. Very useful tips shared. Not doubt that these tips are helpful and using these tips content writers can write quality content easily which can make huge impact to readers. Sharing the experience and thoughts is a great way of expression. When done through publishing an article at Ezine @rticles,it reaches many across the world. This is a great ideas to write quality contents. Quality is the king of any content which figure out and increase more readership. I always hope I can write compelling content for readers, and I have tried various methods and got some improvement. This article is helpful too, for it has refreshed my mind with some new tips. It is worth recommending. Your post is really nice and helpful piece of information for new bloggers like me. Thanks for writing this awesome post for us. Please keep us informed like this. Thanks for sharing! Quality not quantity still looks challenging for so many, still see far too much spam around. I would rather read a 150 word quality article than a stretched out 1000 word article with phrases that could have been one word. also, report the news. what ticks. why say the same thing as others. Really inspiring website. I really hope that I can write an unique article like what you had mentioned above. How long do you need to write a quality, unique and great content comprising around 1500 words? I personally use around 3 hours. Is it okay? I think , how long it takes you to write article does not matter; but how well is the article is what matters most. Cheers. It’s damn easy for copycats to create a spinned contents, but creating our own article writing strategy is important. nice write up, I Will definitely share this article with my friends. I am relatively new to Ezine so this article helped consolidate thoughts on how I should approach writing for this outlet. Thanks. Very helpful……I will surely use your tips while writing. Thanks! Good Points catch Up, well i am going to learn here. It is the New Year to write great content on my site. This was a great post! Thanks for taking the time to write and share! Thanks for writing this quality stuff. I found third and tenth point most attractive!! Wow. Really inspiring words with fresh motivation. Thank you so much for this great write up. Excellent tips packed with prudent ideas. Great article to set the new year on fire and engage an audience. Content is King and Quality triumphs. I’m looking forward to creating quality content and standing out for my niche. What length is most recommended for articles to keep the reader engaged without invading much on their time? It’s really makes easy to write quality content . Thanks for the cool tips n tricks. It is really good tips for writing, English is not my first language, but for your share, it will make easier. thanks for share. This is awesome! Keyword Research is another way to write better articles this year. Research into what others are writing or have written; know the percentage of the organic traffic. Try to see how you can create a solution with your write up and you shall be applauded. This article is a solution to the problem of those who don’t know how to start article or content writing. So kudos to the admin of this site. Wow great! 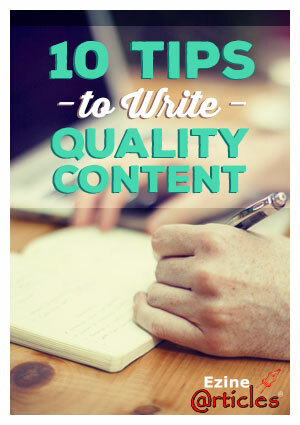 Amazing tips to write quality contents thanks for sharing. But what about authors like me who have been struggling last year to come in spot light of search engines but were not successful. I think this year I must continue what I started last year. But your tips will surely be helpful. Jamiel Lamont Burrows agrees that “passion” is very important.